At dawn on this bright, brittle morning of 9 March 1797, two British frigates, the San Fiorenzoand La Nymphe, to verify their rather uncertain reconnaissance of the previous evening, carried the last of the flood right up into the Goulet to assess the size of the French fleet anchored in Brest. There, not four miles distant from the enemy, they counted 14 line-of-battle ships and 16 frigates. Such daring probes by British ships into French harbours were almost commonplace at this time. Mission completed, they tacked and stood out to sea, reefing their topsails to the freshening NNE wind. Shortly after clearing St Mathieu Point, they sighted two sail coming from the WNW. These were the French ships Resistance and Constance returning after landing a rather curious expeditionary force on the Welsh coast and, having avoided the Channel fleet, were now standing in to their home port. The Constance was a 22-gun corvette and the Resistance was a very fine frigate, mounting 44 guns, eight of which were 32-pounders! The British ships were both originally French and in all probability this completed the illusion that they were friendly, for the Constance and Resistance made no attempt to close with one another and when the British vessels, which had got nicely to windward, suddenly wore and shaped for the Resistance which was leading, the French ships were a good mile apart and quite unable to put up a combined defence. This enabled the San Fiorenzo and La Nympheto concentrate their combined bombardment on the Resistance. Fifteen minutes of this battering was enough and she struck her colours in time for the British vessels to turn their attentions to the little Constance who was by then coming on the scene. This is the moment of the painting. 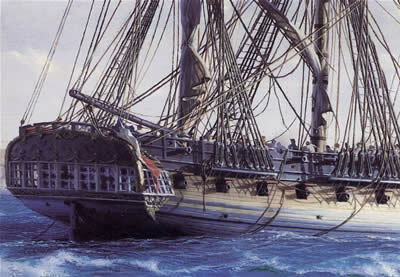 The Resistance on the right has just ‘struck’ and let run her topsail halyards and her ensign in surrender. La Nymphe (Captain John Cooke), in the left foreground having put a party off to take possession, has let fly her jib sheets and backed her mizen topsail to present her broadside which she is discharging into the little Constance on the extreme left of the picture. San Fiorenzo (Captain Sir Harry Neale), centre background, has backed her main topsail to reduce speed and has brailed her driver and backed her jib to come to starboard to deliver her broadside also into the Constance. In a moment both frigates will let draw to pace the Constance in a running point-blank bombardment. The little corvette’s position was quite hopeless, but it was a full ten minutes before she too surrendered. By this time all four vessels were under the lee of St Mathieu Point, not eight miles from the enemy fleet, yet under its nose and the lengthy business of taking off prisoners and putting prize crews aboard was undertaken. Had there not been a spring ebb running out of Brest, the outcome of this engagement might have been different, for with slack water or a flood tide the enemy ships might well have made it into the Goulet. In all probability the Resistance surrendered prematurely, confident that help would soon arrive. That no help came is hard to understand. Perhaps there was a general lack of preparedness in the French fleet for a swift sortie, but more probably a trap was suspected, for it was known that the Channel fleet was cruising off Ushant. Considering the short period in which the two French ships had been under attack, the extent of their casualties and damage was testimony to the vicious accuracy of the guns of the British vessels, neither of which suffered casualties or serious damage. The taking of a prize was not a simple affair. It was necessary for the capturing vessel to provide from its own complement a sufficient number of experienced people to take command of the prize, without reducing their own efficiency too much. Some of the enemy crew would be left aboard to do the bulk of the work, but it was important to judge the right balance of numbers, for the risk that they might overpower the prize crew and retake the ship was always present. The practice was to shift the officers and the majority of the enemy crew off the prize and crowd the men below aboard the victorious vessel under close guard. At times this was no easy task, particularly in bad weather. In the case of this incident, while they were fortunate that it would be carried out under the shelter of the land, the presence of a huge enemy force so close at hand was a very real peril and lent considerable urgency to the operation – an operation of no mean proportions when one considers that altogether something like 400 men had to be transferred by boat between the ships.